When your daughter is on the autism spectrum and everything always has to be precise and make sense, it’s not always easy on the parent. My oldest was five when she learned that in Ireland, Protestants wear orange on St. Patty’s day, so she wanted to know why everyone in the U.S., whether you’re Protestant, Catholic, Buddhist, etc… wore green. She also wanted to know why we as a family would wear anything at all, given that Irish is one of the few ethnic backgrounds missing from our family heritage. This morning, however, I actually felt a kinship with my daughter when I received an emailed question about making boiled corn beef and cabbage. I was quick to point out that in Ireland folks don’t actually eat corn beef and cabbage on St. Patty’s day, that it’s something that somehow evolved as a tradition in the U.S. I also wanted her to know that folks used to boil all their meats in Ireland because of poor refrigeration and sanitation conditions. Folks wanted to make sure they wouldn’t get sick from their food, so they overcooked it. I wouldn’t be surprised if folks are now wondering about me! Which I guess just goes to show that my daughter doesn’t fall from her mother’s tree after all! 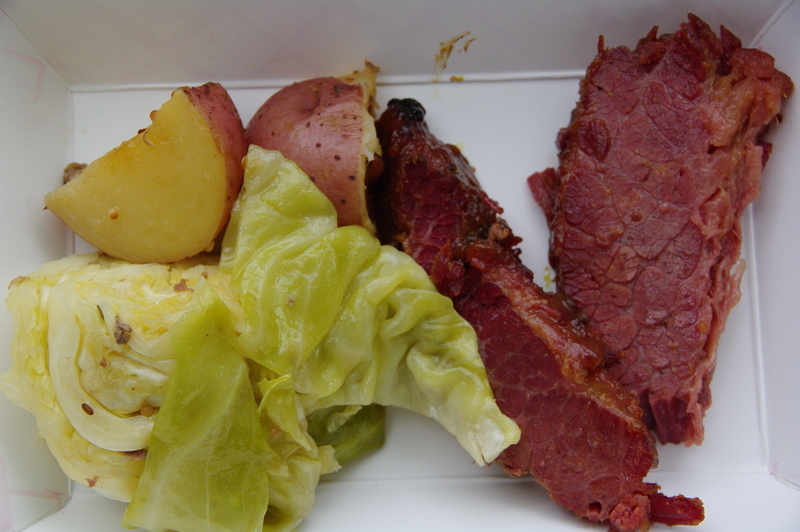 At any rate, I started thinking about corn beef and cabbage and thought I might as well post about it on St. Patty’s Day, though I do apologize that this post most likely is not in time for today’s holiday meal. I actually love corn beef and cabbage at any time of the year. I don’t, however, ever, ever boil corn beef and cabbage. Boiling corn beef and cabbage just makes for a greasy, unpalatable entree in my opinion. I know some may disagree with me, but boiling cabbage turns it into an ugly shade of green which no one should ever see on their food plate, and boiling the corn beef releases the fat into the cooking liquid which is quick to congeal when cooling. Definitely not my idea for ideal presentation of food! In addition the vegetables you add to corn beef and cabbage like carrots, turnips and potatoes lose much of their valuable nutrients when you boil them. So what should you do then? Slow cook it in the oven is my advice. 1. The pan: You want a nice large heat proof pan with a high cover. If you don’t have a cover, you can use aluminum foil, but you should double fold it and make it into more a tent shape than flat over the pan. This will allow for more space for your vegetables and cabbage as well as allowing the heat to circulate at the food cooks in the oven. 2. The corn beef: I find that a thin cut corn beef is better than a thick cut. It’s usually more symmetrical in width which allows for more even cooking. Also, because it’s thinner and flatter, though, longer, it cooks more quickly than a fatter, rounder cut. As a rule, unless you’re single or just a couple with no children, a four pound cut of meat is best. As corn beef cooks it actually shrinks down in size considerably and by the time it’s fork tender for eating, it’s about half its original size. A 4 pound brisket is enough for dinner for our family of five with some leftovers for lunch the next day. Also, you should always try to cut away as much of the fat as you can. One, it helps to reduce the fat and grease. Two, it means that the spices and herbs you use to season the meat will actually reach the meat and not just rest on the fat. As well, if you have a rack that fits into your pan, you should insert it and put the meat onto the rack. It allows the heat to circulate under the meat for more even cooking and also helps to reduce any grease from sticking to the bottom of the meat. Finally, you should season your corn beef. Most come with a seasoning packet that usually is a mixture of chopped bay leaves and mustard corns. I like to take those and add garlic, onion powder, black pepper and oregano. Then I add the smallest amount of olive oil to make a barely moist paste which I rub all over the corn beef. After I stick whole cloves into the corn beef. 3. The cabbage: Don’t just use green cabbage. I like to mix both purple/red cabbage with the green to get a melding of flavors and colors. Also, most recipes call for simply cutting the cabbage into quarters. I find that this makes for tougher cabbage. I cut them into 16 wedges and find that this makes for a more fork tender cut of cabbage. You don’t want to add the cabbage at the beginning. It doesn’t take as long as the meat to cook so add it more like a third or half way into the cooking. When you add the cabbage, put the wedges carefully around the meat so the wedges stay together. 4. The vegetables: Be creative. We have added potatoes, carrots, turnips, butternut squash, beets, etc…. My kids favorites continue to be the traditional potatoes and carrots, but even with those I vary them. Nowadays you can get a variety of colored potatoes and carrots in white, red, purple, orange, pink. What’s important to keep in mind is that with this dish, you really should stick with root vegetables. For the length of time that you need to cook the meat, vegetables which are quick cooking really don’t work well. If you do choose to use vegetables like zucchini or broccoli or mushrooms, don’t add them until the last 15 to 20 minutes of cooking time. Another thing to keep in mind is your size. All the vegetables should be the same size for even cooking. I like to cut everything about 1 1/2 inches in length and width. I find it cooks well in the time allowed. Also, be sure to season your vegetables before adding them to the meat pan. If you just add the vegetables as is, they will be bland. I like to use a mixture of herbs and garlic and black pepper. I don’t ever add salt because the corn beef is salty, and you want your vegetables to complement the salty meat. Finally, like the cabbage, the vegetables don’t need as long as the meat to cook. You should add them about 1/3 to halfway through the cooking time. 5. Cooking: As I mentioned, the method I think is best for cooking corn beef and cabbage is slow roasting them in the oven. Preheat the oven to 350 degrees while prepare the corn beef. First, wash the corn beef with cold water and pat it dry. This helps to remove some of the excess salt on the outside of the corn beef. Remove as much fat as you can and season the corn beef with a herb paste. Place the corn beef on the rack in your pan and stick the whole cloves in. Then, add some liquid because I find that adding some liquid to the pan helps to make for a moister piece of meat. I actually make a mixture that’s about a quarter to a half cup of honey with about one cup of water that I pour over the meat. Later when the meat is done, I turn that into a gravy/sauce by making a rue of olive oil and a gluten free flour or mixing cornstarch with water to thicken the liquid. Cover the pan with the lid and allow the corn beef to begin cooking for about an hour. You should always begin cooking the corn beef first and add the vegetables and cabbage later. The meat takes much longer to cook and you don’t want to overcook the vegetables. Also, if you begin cooking the meat, it releases some of the grease and fat which you can remove before adding your cabbage and vegetables. As a rule, I cook the meat for about one to one and a half hours first before adding the vegetables and cabbage and cooking for another two to one and a half hours. During that hour or so, I peel, chop, and season my vegetables and cabbage. After about an hour, remove the corn beef and strain all the grease and fat out of my liquid, being careful to do so over a bowl so you can keep the liquid for the rest of the cooking. If I need to so do, I also wash away any grease that’s accumulated on the rack, too. Then return the rack to the pan and replace the corn beef on top of the rack. Carefully place the vegetables around the corn beef. You should be sure to put things like potatoes and carrots first on the bottom because they often need more heat to cook. Then place the cabbage wedges on top of the vegetables around the corn beef. Pour the saved liquid over the cabbage, vegetables and meat, and cook for another two hours or so with the lid on. When your corn beef is done, it should be fork tender. The same with your vegetables. When the corn beef, cabbage and vegetables are done, I remove them to another pan and thicken the liquid. You can do this by making a rue of olive oil and flour that you slowly add the liquid to. Or you can mix cornstarch with water and add that to the warm liquid. Either way you need to heat the liquid on the stove top, stirring frequently until it thickens. Then pour the sauce over the corn beef and cabbage and serve.